Phenix Technologies is committed to serving the needs of our customers and providing the best world-wide customer service in the industry. As a global leader and preferred manufacturer of high voltage, high current and high power test systems, you can rest assure that we stand behind every product we deliver. Please contact us for service, troubleshooting support, replacement parts, or any questions you may have. We’ll get you to the right person quickly and will not stop working with you until you are totally satisfied. Return Authorizations are issued for Service / Repair and Calibration Work. Please contact the Phenix Technologies Service Department to obtain your RA Number. Download the RA Form and include as packing slip. You may e-mail your completed form to info@phenixtech.com to obtain an RA number. Optimize your equipment through our experienced and knowledgeable team of support engineers, service and sales managers, and technicians. 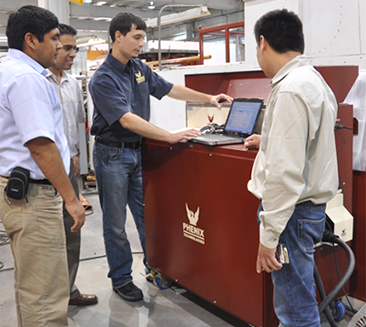 On-site assistance ensures your test system operates with maximum performance from the start. Check-up maintenance and calibration notifications, maintenance contracts, and calibration expertise keeps your equipment at peak performance. We offer scheduled visits to a specific area to provide cost savings to multiple customers. We offer full service repairs on-site or factory returns. For individual stock components/assemblies, contact us for quotes and information. Upgrades, updates, enhancements, and modifications. We offer upgrades and improvement options so that your test system operates more efficiently which include refurbishment, modification, modernization, and after-sale accessories/components.